Integrate the metrics that matter directly in your UI in a way that matches your unique look and feel. Groove HQ shows their customers analytics for support activities and performance. Their customers can view metrics such as support ticket volumes, average resolutions per day, and average time to resolution. Visualizations enable users to easily monitor trends in the data. Great data is useless without great code. Our simple and straightforward SDKs enable robust, scalable, and flexible integrations. 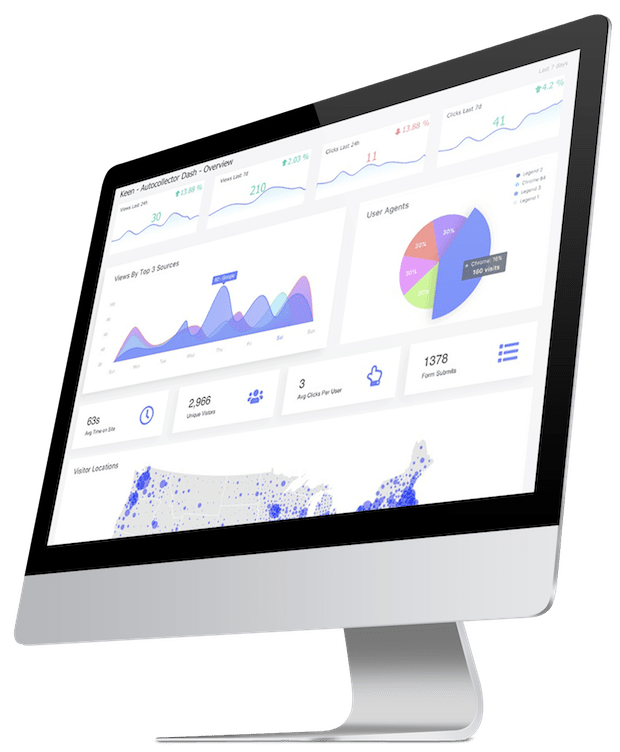 We take care of the complex and intricate details of customer-facing metrics, so you can get up and running with Keen in just a couple of minutes. Easily collect and enrich events from the platforms and data sources you need with SDKs for the languages you love. Use our robust compute functionality to uncover insights and deliver metrics to your customers. Use our flexible presentation library to seamlessly embed and deliver metrics within your UI. Get up and running with Keen in just a couple of minutes with a few lines of code. Launch a proof of concept in hours. Rapidly iterate, ship, and free up months on your backlog so you can get back to building awesome features. Your data, your language, your stack. Easily collect events from multiple sources with our flexible API and SDKs. Work within your data and security models. Seamlessly embed metrics that match the look and feel of your products. Keen's fully managed platform lets you focus on the what and why of analytics. You shouldn't have to constantly be hands on managing your analytics stack. You grow, we'll scale. Over 50,000 developers use Keen to easily and seamlessly ship customer-facing metrics. Pay for what you use - nothing else. Avoid archaic pricing models, so your cost is always right-sized. From chat to custom support options, we've got you covered at any stage. We use Keen for pretty much everything related to analytics. When we first started, we needed to provide analytics dashboards to our customers. To do that ourselves, I just didn't even know where to start. Keen is core to our product. Keen took what would have taken us over a year to develop and got things up and running within 2 weeks. You guys made it super easy. The docs were great, the explorer was great, it was easy to poke around and try out different things. I felt like I was talking directly to the developers who were working on the product on your end.